So says Lina Mendoni, secretary general of the Greek Culture Ministry in response to questions that the Greeks aren’t paying enough to safeguard its sites. As protests continue to unfold in Greece, one report looks back at the theft of art from the Greek National Gallery in Athens. Anthee Carassava, reporting from Athens for the L.A. Times can’t help but to add a few glamorizing details to the theft. One of the thieves is a “virtuoso lock picker”. 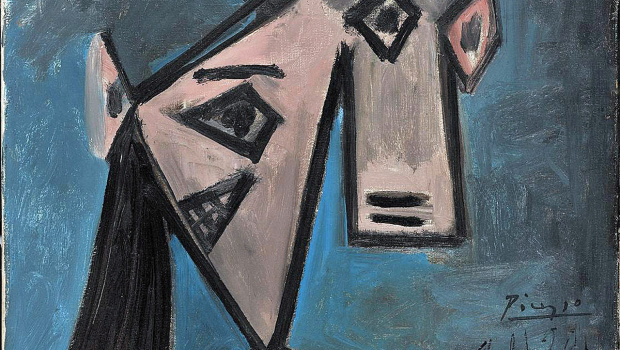 The thieves manipulated the security system and eluded the one guard on duty and stole works by Picasso (pictured here), Mondrian, and a sketch by Guglielmo Caccia. I’m always skeptical of reporting in one nation’s papers pointing fingers at the ineptness of another nation’s efforts to protect its heritage. This problem plagues loads of international reporting in places like Italy and also Greece. And even if we take the United States or United Kingdom, theft and looting takes place, and there aren’t enough security guards to police remote sites and small institutions, which results in the theft of objects. Market safeguards are unreliable, and the law enforcement framework all over the world is still developing. So when funding pressures and unrest take hold, there can be dire consequences for cultural security. Greece’s economic crisis has left the Culture Ministry desperately short of cash, resulting in a near-shutdown of scores of museums, dwindling archaeological work in various parts of the country and, in some cases, severe cutbacks in security. At the National Gallery, the curator acknowledged that although the safety of its collection “is not in peril,” budget cuts have scaled back security personnel by about 50% since 2010, leaving the country’s biggest storehouse of fine art with just 19 of the 37 guards it employed before the fiscal crisis. Greece has never been a generous investor in culture. Even in the 1990s heyday of spendthrift policies, Athens allocated just 0.7% of the national budget for the promotion and preservation of Greece’s cultural inheritance. Now nearly bankrupt, the state has halved that figure to 0.35%, allotting 42% of that — about $173 million — to the operation and security of museums, monuments, monasteries and archaeological sites, according to the 2012 budget. Government officials are emphatic, however, that the financial crisis is not taking a toll on the safety of Greece’s fine art and antiquities. About 1,900 government-paid guards protect more than 15,000 museums, monuments and archaeological sites across the country. Of these, 1,350 are full-time staff members; the rest are either contract employees hired during the peak tourist season or civil servants relocated from state corporations that the government shut down last year in a bid to slash public spending. “What am I supposed to do with a 63-year-old mechanic or bus driver who is clueless about antiquity and is just interested in clocking time until retirement?” asked Giorgos Dimakakos, the head guard at the Acropolis, Greece’s landmark monument. In recent months, Culture Ministry guards have heightened demands for permanent employment and an exemption from further austerity cuts, saying the government’s Band-Aid solutions to personnel shortages pose grave security and liability risks. With poverty levels rising and more than 100,000 businesses shuttered or close to bankruptcy, art and antiquities thefts are up by at least 30% in the last year, said Kouzilos of the special police unit. It’s hardly a surprise, then, to see a dramatic increase in small-time hoods and first-time crooks trying to join the ranks of seasoned art thieves. I’d be interested in hearing how this security compares with even the ‘model’ in the rest of Europe or North America. I also wonder if it might be time to prepare a ‘red list’ of objects from Greece that the art market should report and flag. Anthee Carassava, Art heist robs Greece of a sense of security – latimes.com, L.A. Times, February 11, 2012, http://www.latimes.com/news/nationworld/world/la-fg-greece-antiquities-20120212,0,3742515.story (last visited Feb 15, 2012). Are there any outside efforts being made to counteract this uptick in crime during these turbulent times? As a budding student of art crime, I would be very interested to know if there are any teams being dispatched to aid in the safekeeping of cultural items and heritage sites. None that I’m aware of yet. Though the market is on notice not to purchase these objects. There is precedent for teams to assist during armed conflict, but not really during times of internal instability. If Greece let collectors and investors share ownership of antiquities and artworks in its museum collections, its expanded archaeology and arts endowments could generate generous funding for its museums, fieldwork and commissions via capital income. By letting the capital appreciation on its collections go to waste, instead of sharing it with collectors and investors, Greece risks letting the collections themselves go to waste, and that’s a terrible shame. Antiquities should support archaeology, artworks should support the arts, specimens should support the sciences and documents should support the humanities. Leaving the financial value of all these financially- and culturally-valuable collections immobilized, as traditional museum management methods do, unnecessarily raises the risks to their integrity. It seems like some provisions should exist for preemptive action to protect antiquities and objects of cultural heritage in times of turmoil. Perhaps I’m overreacting – I’m Greek-American, so it’s a bit of soft spot for me – but given the events and subsequent losses in Cairo last spring, it seems like international preventative action should not be such a lofty expectation. Yes, and UNESCO would seem to be a good body to help step in, unfortunately its had a huge reduction in its funding because of a silly dispute over Palestine, which resulted in the U.S. cutting all funding.